Please allow me to introduce: Grammy Nominated Recording Artist: "Special Request Ft. Rey T." “Special Request Ft. Rey T.” - Is one of the most sought-after Groups (6-8 piece Artist/Band), in and outside of California, They have Toured the World of Japan for (6 months) and have Toured, playing Major Venues and the Chitlin Circuit. 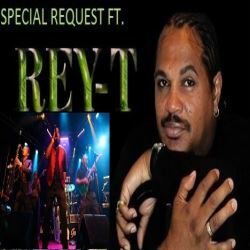 “Special Request Ft. Rey T.” - They perform at Festivals, Fairs, Casinos, Wineries, Indoor/Outdoor Venues, Boat Cruises, Car Shows, Wedding Events, Summer Concert Series and much, much more! "Special Request Ft Rey T." - The live performance is something you would not want to miss. They hit the stage with the level of energy that tantalizes and rocks any crowd, bringing them out of their chairs. They have performed for thousands of individuals, making them one of the most requested entertainers in all of California. They have a unique Lead Singer with a combination of hot vocals, a dynamic stage show, and a dynamic rhythm section. They have the style and showmanship that causes the audience to participate to the extent that the performance leaves them feeling as if they were part of the show!